2019 Recruiting Disasters in the Pac-12: UCLA, Washington=Boise State? My friends….we are not supposed to have five articles this week, but this stuff is just too juicy. I was supposed to take a break this week, but comparing Washington to Boise State in recruiting was something I had to get out to my friends for discussion. Why? Because Oregon is in a position with recruiting that I never thought possible and, with the results occurring in the rest of the conference, the world is truly flipped upside down. I wrote an article about how Coach Mario Cristobal was about to break two recruiting records at Oregon … and he did. The Duck staff has broken the all-time one year record for 4- or 5-star players (14 to 12) and the all-time record for two years as well (25 to 21). And these Ducks are not done! Justin Hopkins of ScoopDuck.com is well known as an Oregon Football recruiting guru, and he spends an incredible amount of time on the phone talking to his connections that supply us fans with great information. It is one of very few pay sites that I recommend, as the price is nominal for the updated recruiting information and knowledge. He published an update two days ago concerning Pac-12 recruiting that we have to savor for how good it is for Oregon, and how bad it is for some of our conference competitors. After being on the other end of these comparisons for so many years in the past … this is sweet. Justin (JHOP) refers first to Oregon, who with 18 verbals, is No. 1 in recruiting in the conference at the moment. (Rivals.com) Did that last sentence sink in? The Ducks are No. 3 nationally and leading the conference by a mile in 2019 recruiting. How often in your lifetime have you seen that written about Oregon Recruiting? “Mario Cristobal is launching a full-scale assault on the conference and the nation. I know it’s been said but it needs to be repeated, look at what he is doing. He is slowly (Not overnight) building an Alabama-esque program of the West. A monster. Remember … this is written by someone who makes a living by studying and analyzing Oregon football recruiting; I’ve seen him make exceptional, ultimately true predictions. 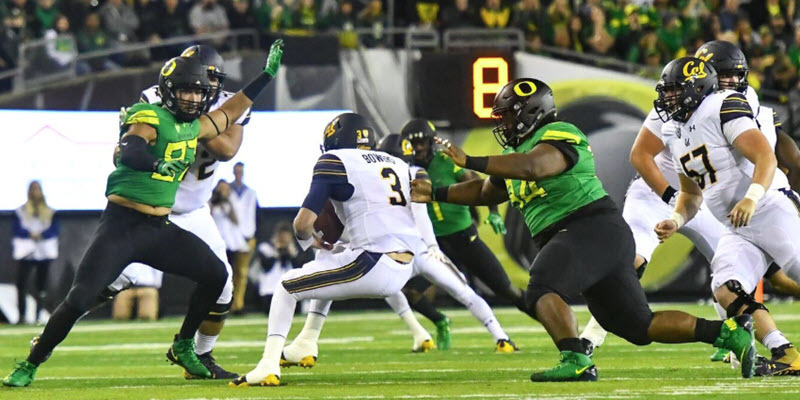 While an advocate of Oregon, he has made mistakes like the rest of us and yet even with those humbling experiences has come out strongly in favor of the Cristobal method. What he wrote about Washington (No. 3 in the conference, and No. 29 nationally) will raise a few eyebrows in a couple of states, as he is not impressed with what is going on in Montlake. With the addition of Bryan Addison to the 2018 recruiting class, Oregon moved up to a final standing of No. 13 for last year, 2018, while Huskies finished at No. 15 nationally after all their howling about recruiting. 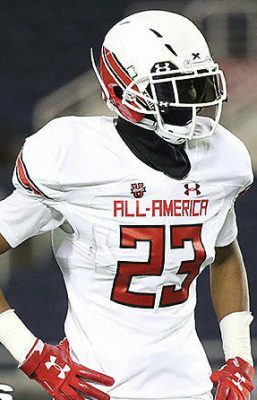 Bryan Addison is a 6’5″ receiver the Huskies wanted badly and he committed to Oregon without even visiting! A great way to compare recruiting classes is looking at the conference opponents’ recruiting, and ask yourself who among their verbals you would have liked to have committed to Oregon. JHOP knows all these players better than most, and admitted that he would like to have seen all of the eight that committed to Stanford come to Oregon, as the quality of recruit there is quite high. By contrast he felt that that the Huskies only had two out of their 13 verbals that he would have preferred to see coming to the Ducks. Two! And yet Washington offered scholarships to seven of the verbals that Oregon presently has, while USC wanted eight of the Ducks’ commits and even Alabama wanted six of the future men in green with their scholarship offers. The owner of ScoopDuck.com is not reserved about his assessment of Chip Kelly‘s recruiting class at UCLA which presently stands at only seven verbals, none over 3 stars, and sits at No. 10 in the conference and No. 74 in the nation. “Chip finally woke up and figured out you do have to recruit, they don’t just call you. The Bruins have 7 commits but they don’t have a single four or five star on the list. Oregon would take Michael Martinez but that’s about it. If Chip is hoping to win based on scheme and development, he better be superb. My friends … the information is valuable, but a subscription over there is worth the price in entertainment alone. JHOP had me hooting! Yes my Sun Devil friend, but you have it all wrong. This is what Chip Kelly should have been doing at Oregon while camping consistently in the top five in the nation with the bowl and playoff results. The Chipster dramatically under-performed in recruiting considering what his opportunity was, and Coach Mario Cristobal is proving in only August of his first year what the potential can be. As a greybeard who has watched and studied so much Oregon football over the years, it is hard to know whether I should be celebrating, or simply be grateful for the recruiting fortunes of my beloved Ducks. 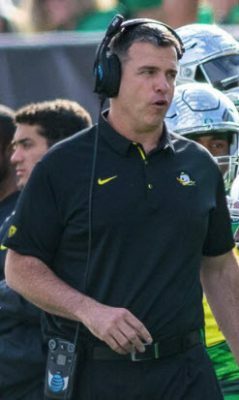 The step Oregon has taken in recruiting is massive, and even with the best coaches available–I would have thought it would have taken three or four years to build recruiting to this point. If you wish to comment? No profanity, no name-calling, no belittling and no insults….not even a back-handed compliment is allowed. Follow our rules of commenting, or I will delete your comment immediately and a second infraction gets you blacklisted from ever commenting here again. Check the comments on other articles on this site and you’ll see we are a temperate group. Reasoned disagreement is fine, as we enjoy learning from others.